Shift is a plugin that creates animated spectral shifting effects. It is based around a step-sequenced envelope generator that allows to easily construct sophisticated patterns that are sent to control either a frequency shifter or a ring modulator. This finely-tuned setup produces a wide range of interesting effects: from gentle inharmonic detune and chirping, to extreme spectral-thinning and metallic zaps - with intricate pulsations in perfect sync with input audio. – Alias-free frequency shifter and ring modulator effects. – Envelope matrix offering 10 envelope shapes, adjustable time, curve and lag. – Stereo-linked calculations in ring modulator for lower processor load. 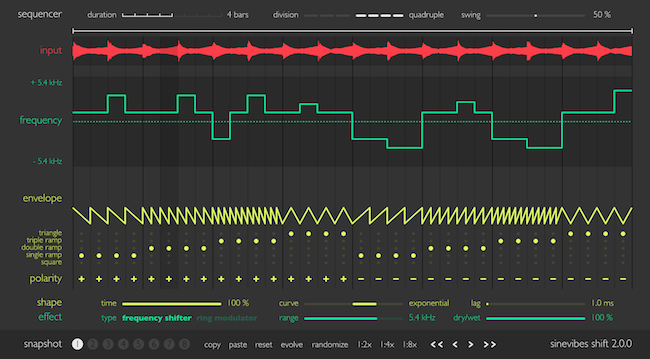 – Fixed anti-aliasing not applied to full extent in ring modulator.